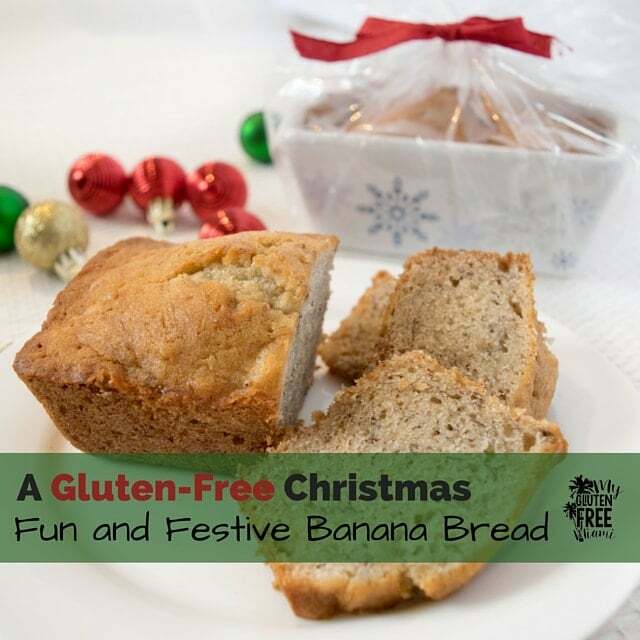 Gluten free banana bread is perfect for everyone on your gift list! Nothing says Christmas like fresh baked banana bread! Before going gluten-free, every Christmas I would bake tons of mini banana breads and pass them out as little gifts. Everyone goes bananas for banana bread! This simple recipe was inspired by a recipe of a good friend (I don’t know where she got it, but it’s really good!). Miss Jane is quite the expert when it comes to banana bread. I couldn’t let becoming gluten-free ruin my Christmas tradition. I had to make the recipe gluten-free. Turns out it was not that hard and no one can tell that it is gluten-free. I get requests for this recipe all the time. You are going to love it! I found these super cute ceramic mini loaf pans at Michael’s after last Christmas. I think I paid 50 cents each for them. They are pretty and reusable. I saw them this year at the store for a dollar. I used to buy disposable paper baking pans, but these are actually cheaper and much cuter. You can give them with the gift or just buy 4 and use them as your own mini loaf pan set! This recipe freezes really well so you can make them ahead of time and just thaw out when needed! Turns out transforming the recipe to gluten-free only took a few adjustments. A high quality gluten-free flour. I use GFJules (affiliate link) and I love it because I do not have to worry about adding xanthan gum and it doesn’t make my baked goods taste like beans. If you have a favorite flour, by all means use it. If it does not already have xanathan gum, you will need to add 1 teaspoon per 1 cup of flour. When making banana bread recipes usually call for an approximate amount of mashed bananas. This gluten-free banana bread requires one cup. If there is to much liquid the bread stays mushy on the inside. Banana bread almost always calls for buttermilk/ Does anyone ever have buttermilk on hand? I don’t and I’m not buying it for one recipe. I always use 1 teaspoon of vinegar and enough milk to make half a cup. I don’t use them in baking. It’s a personal preference, you can add some if you like. Though if you are giving them as gifts, I would suggest leaving them out. That’s about it! Gluten-free or not, everyone will be thrilled to receive one of these mini banana breads as a gift! Can’t get enough of banana bread? Try this recipe for gluten free banana bread with cinnamon streusel! Combine vinegar and milk. Allow to sit for 5 minutes. Stir in eggs, vanilla, banana and milk. Add baking soda, salt, and flour. Mix well. Pour into individual baking dishes. Bake for about an hour or until toothpick comes out clean in center. I prefer banana bread without nuts too. Looks delish and what a great gift idea! That looks SOOO soft–just the way banana bread should be! Freshly baked banana bread is like a great big hug! Perfect for gift giving. Yours looks delicious. I could eat banana bread every single day! So glad you were able to make this GF for Christmas, it looks perfect! This will be my second GF Christmas and I feel much more prepared this year! May have to put this banana bread on the menu! 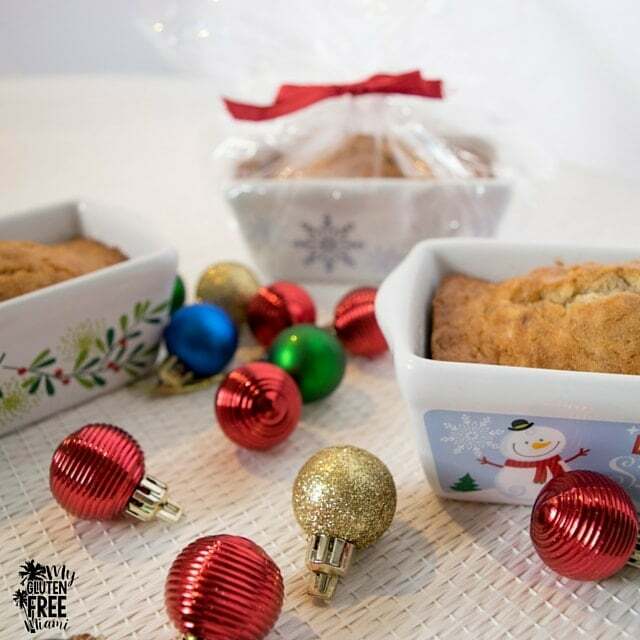 Mini banana bread is a great foodie gift idea! Love that it’s GF too. Banana bread is a great idea for quick hostess gifts! Those pans are perfect for giving. This sounds like such an easy & delicious GF banana bread recipe! We just found out my youngest has a gluten intolerance. He absolutely loves banana bread so this gets me excited to make this for him. Thank you! There is nothing better than a good banana bread. And it seems to work so well gluten free. Your loaf looks perfect! This banana bread looks amazing! Definitely have to give it a try! 🙂 And I really love those bread pans – so cute! Such a great holiday gift idea! Looks moist and yummy! love this mini form too! It is delicious! Everyone gets excited when they see I am making banana bread! Oh, what a wonderful idea for a Christmas gift! I love it when I receive home-made gifts like this; it makes it all the more special. I love homemade gifts as well….I think that the little ceramic pan makes it even more special! I love banana bread and my wife has recently become intolerant to gluten. I’ve never tried GF-0flour so might have to give this a try. I hope you like it! It is a favorite in our family, no one misses the gluten. I really like GFJules flour. It just seems to work well with everything.